She ruled the street, moving quickly and deliberately; yet she looked slightly out of place. 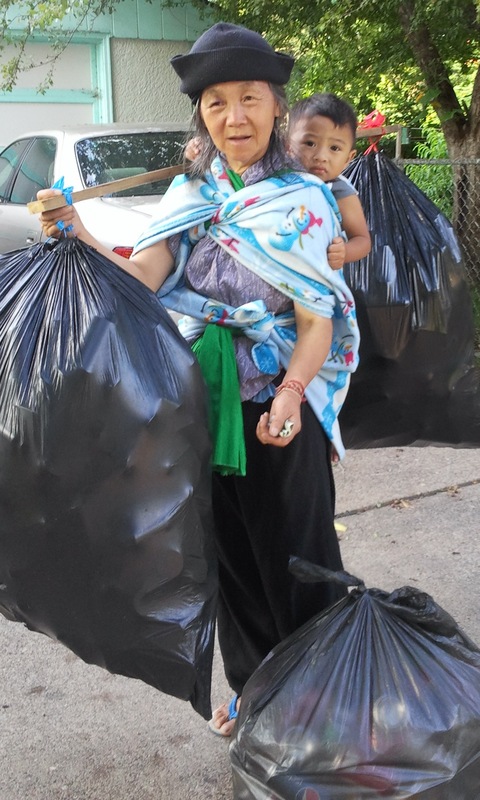 She had three bags of cans, ready for recycling; two were expertly balanced on a pole over her shoulder, the other was in her hand. A child in her care was enjoying the early morning air, riding in a sling tied to her back. This scene was not in some distant land; it was here in North Minneapolis, near the path of the May 22 tornado. She is a woman of great pride, industry, and honor. I pulled-up along side her and slowly exited the car. I had to meet this industrious elder. I did not want to startle her, when our eyes met I lowered my gaze and bowed my head to her, she returned my smile. She spoke first, “No English, Hmong.” That would make the conversation complex, I realized, but not impossible. Using gestures I hoped would parallel my words I spoke, “I honor you, I see you work hard, May I help you?” Her smile said she understood some of my intent; she sat down the bag of cans in her hand, while continuing to balance the other two. I remembered one of the three Hmong words I know. Trying to recall what I could seldom pronounce properly, I spoke , “nyob zoo” I extended my hand to her, with a small amount of money. I motioned to my camera phone; she smiled and turned toward me, preparing for the photo. I clicked one picture, her child smiled and waved. I tried my best to properly intonate my second Hmong word, ”Ua tsaug.” I must have said it somewhat correctly as she smiled and replied, “Ua tsaug” as the young man laughed and waved one more time. Before I climbed in my car I again smiled, bowed my head to her, and she responded in kind. As I drove away I was thankful the chance to begin my day with such an encounter. I feel sad for those who never have met such royalty. I realize, this is why so many can speak so harshly about immigrants, the poor, or any other “category” of people. They have never seen or never meet a person of this caliber. Then, with no human personal reference it is a short journey for them to pass judgments and write laws that deny their very existence. May your days be blessed with encounters that open your eyes to all humanity. NOTE: The links to the videos are to allow you to hear proper pronunciation of these words. Also, thanks to all my Hmong brothers and sisters who patiently taught me, and have shown me much love. Marque, this is a very touching encounter, indeed. I appreciate the perspective you have to offer. I hope many who read this will be provoked to thought and action! It is a touching and wonderful narrative. But as is often the case when you discuss immigration your conclusion is incorrect. As a tea party party conservative and as one who is deeply involved in urban ministry I have met royalty on many occasions. I love the history of America which has been built and continues to be built on immigrants. I support legal immigration, but I do not support illegal immigration. While you do not claim to be liberal, you have taken a liberal position on immigration and have embraced a liberal stereotype about those who do not share your view on immigration. And the stereotype is wrong.